Four official documents, regarding the Arlosoroff assassination and the trial of the suspects Avraham Stavsky and Zvi Rosenblatt. Palestine, 1933-1934. English. 1. 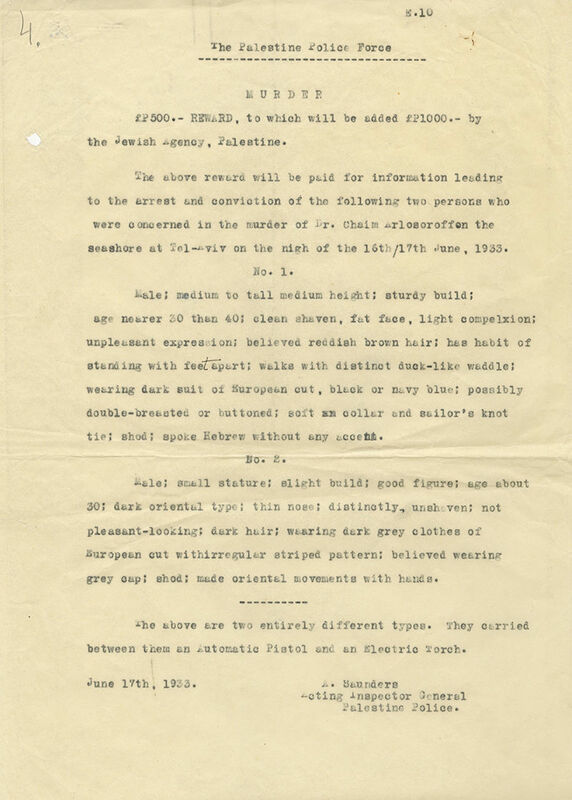 Police broadside dated 17.6.1933 informing that the police and the Jewish Agency promise a prize of 1500 pounds to whoever supplies information which will lead to the suspects in the assassination of Arlosoroff. 2. Arlosoroff's autopsy report dated 17.6.1933. Signed in print by Dr. Haim Stein and Dr. Aryeh Alutin. 3. Medical report from 3.7.1933 about the medical treatment given to Arlosoroff in "Haddasah" hospital in Tel Aviv and the cause of death. Signed in print by Dr. Aryeh Alutin and Dr. Meshulam Levontin. 4. Verdict by judge Joseph Moshe Valero from 15.6.1934. The verdict states that Stavsky and Rosenblatt are innocent, and that the motive for the murder was sexual and not political. leaves, approx. 32 cm. Good condition. Filing holes, some stains. Folding marks and creases. Small marginal tears, some repaired. Some text completions in pen.